Continue my Beginners Running Program or...? I have been following your Beginners Running Programme 1 (15 minutes in 8 weeks). I am now on week three, day one. At the gym today I did not manage the three minutes even though last week I was doing the two minutes very comfortably. I have very sore lower legs and when I asked the fitness expert at the gym he seemed to thing it was just beginners muscle pain. However I am more inclined to think that I am too overweight to run (I am 233lbs). Should I continue with the program or should I repeat week two until I feel able to do three mins? 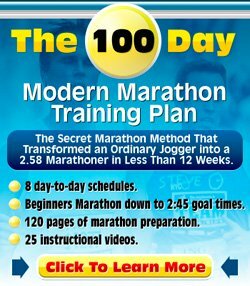 Good on you for picking a Beginners Running Program from my site ! From what you are saying, I think your fitness instructor is right and it is probably some muscle pain. If you can do week two, you can do week three. Maybe you were pushing yourself too much. Maybe you just had an off-day. You are definitely not too overweight to run. Remember, the running part does not have to be fast. As long as it is just that bit faster than walking, then I am happy. I'd say, try to continue the program. However, if you keep on experiencing the same issues the next two sessions, you might want to consider doing week 3 again, before you push on to week four.